While perusing my daily eBay alerts I have set up for items that come across the auction block, I came across one I had never seen or even heard of before. Apparently on May 16, 1947 there was a fatal accident on the Georgetown Branch somewhere in Bethesda in which a train struck a private passenger bus, killing three persons and injuring five. The bus appears in the photo on its side, along the tracks, wrapped in chains and surrounded by emergency personnel. 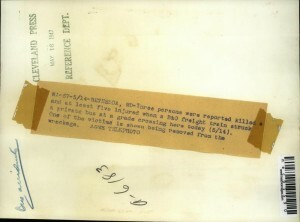 The caption reads that the photo shows one of the victims being removed; you can see them wrapped in white, on a stretcher, being carried off in the center of the image. A nonetheless, a tragic and fascinating reminder that even though the Branch had relatively little traffic in its later years, earlier on it was much busier, the track in better condition, and trains no doubt were moving faster. I have read about a few other occasions where people and vehicles were struck along the line. Well, that didn’t take long. I posted a link to this blog post on the wonderful Bethesda Chevy Chase Back In The Day Facebook group and within minutes the mystery was solved. 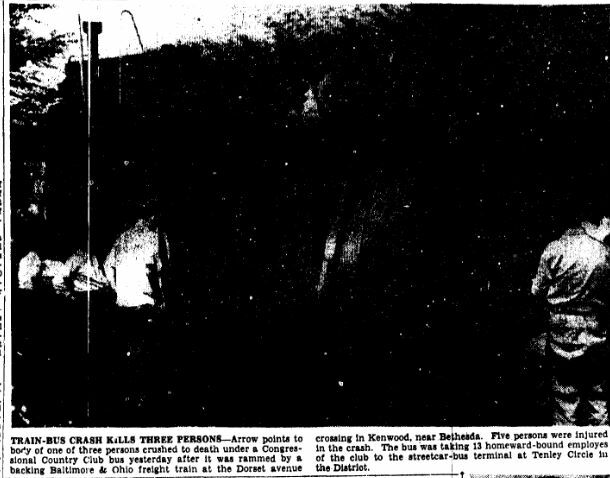 Seems the bus was owned by the Congressional Country Club and was crossing Dorset Avenue when a train struck the bus. Passengers were employees from the CC being taken to the local trolley trolley terminal at Tenley Circle. I would wager that the train was traveling as it normally did, caboose-first, when it struck the bus. First up, it would have been relatively quiet as the business end of the train (the engine/loco) was far away, pushing the train. 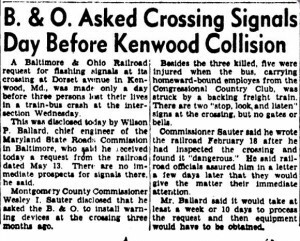 Second, I don’t know for sure but I believe they would not have blown the whistle or flagged the small Dorset Ave. crossing. Partially because the crossing would have been very minor back then and the neighbors probably wouldn’t have liked it too much. HUGE thanks to Jerry P. for making the pull and finding the following Washington Star sources! 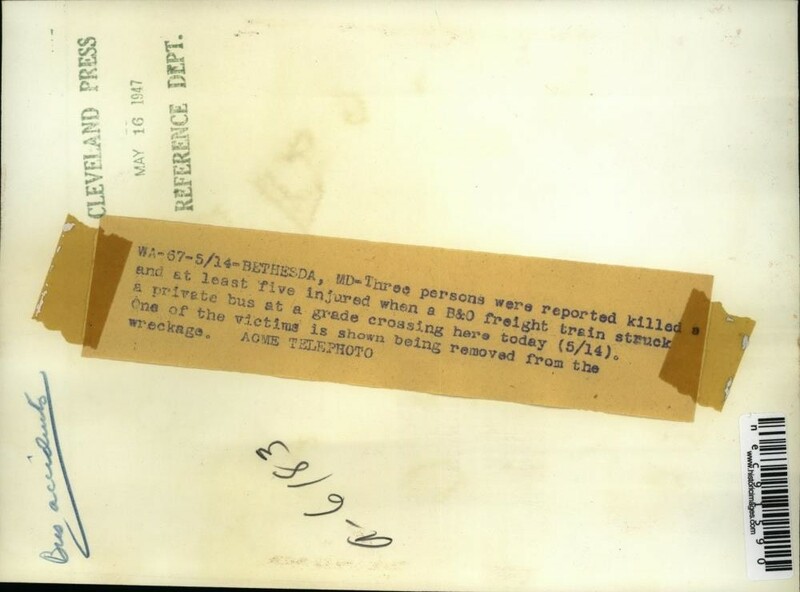 Jerry notes that the casualties were caused not as much by the impact, but rather the people attempting to escape from the bus as it was pushed down the tracks by the freight train. 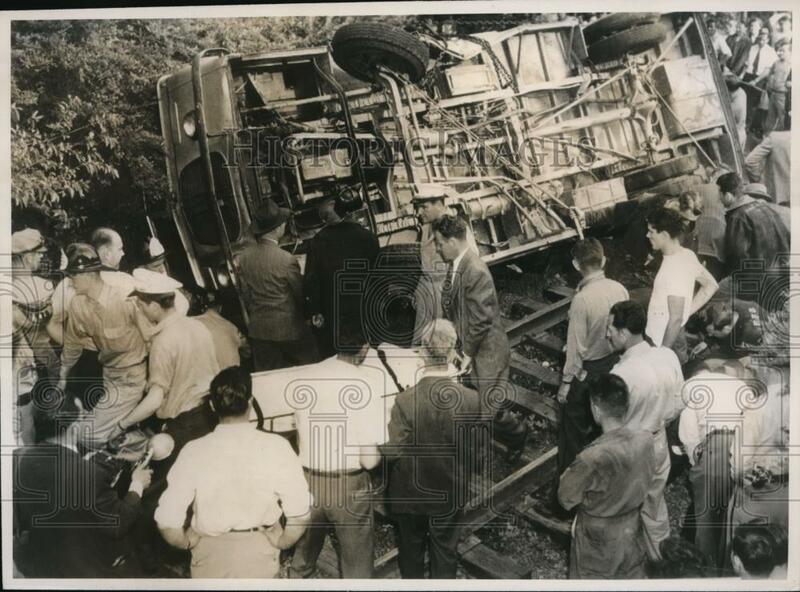 My grandmother, Mrs. Shirley Yates-Gordon was one of the 3 passengers killed in this tragic accident. She had three children, my mom who was 8, her brother age 6 and sister age 2. So I never got to meet her. We were floored when we ran across your article and immediately cried. Thank you for your research. I will forward this article to my Aunt and Uncle…unfortunately, my Mom passed away. But she would have been grateful. Sharrin, I’m so very sorry to hear of your loss. It’s truly a heartbreaking story and one that sticks with me as I do my research. The main reason I share information on the site & blog is to meet folks who have first & second hand experiences with the history of this little branch line so I’m glad you were able to fill some gaps with your family history. Thanks for commenting and sharing your story! All the best. If I’m not mistaken, Dorset is the crossing between little falls and river road? Was it ever actually signalized? There unfortunately does not seem to be any photos of that particular crossing, or section of the line. 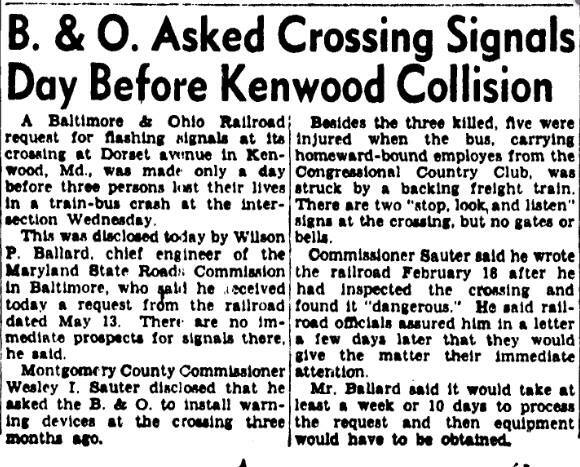 There is one photo taken a year later from 1948 though (that I believe is on this site) that shows the connecticut ave crossing which had had signals installed by then, so hopefully that means Dorset did as well.